Opal: [speaking about the Hamiltons' country house] This is Bergman. Pure, unadulterated Bergman. Of course, the people are all wrong for Bergman, aren't they? Nashville was the first "R" rated film that my father took me to see. At 14 years of age, I was many years from NYU film school, and a neophyte when it came to appreciating cinema. I am now 39, and to date I have seen tens of thousands of films, not to mention possessing a sizable video library. Considering my love of social politics, there is not a month that goes by that I have not thought of this film for one reason or another. There are some movies that you simply see, and there are the rare few that become part of the soul. 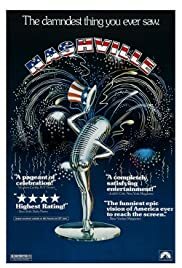 Simply said, Nashville is a singular work of cinematic genius that has gone dreadfully under appreciated for the last 25 years. It is a film chock full of life's little (and not so little) truths; some happy, some sad...all meaningful. Now that it is making a long overdue reappearance on DVD in it's original (and integral) widescreen format, it is my sincerest hope that people will avail themselves of the opportunity to discover this forgotten gem for themselves. Lastly, that this film did not make the AFI's 100 great American films is an absolute sin.